Even the ATM screen bows to say thank you! A tree next to our kindergarten playground. Along the canal near school. Fruit is another one of my loves. It's expensive in Japan, but worth it because it's always good. You rarely get a bad piece. These are my new find. They are tiny kumquats, the size of cherry tomatoes, called kinkan. You only eat the sweet peel because the inside is quite sour. Supposedly they are a good way to clean your palate after sushi. I know that admitting that I like Starbucks makes me tragically unhip in the Portland scene, but when you are far, far away from the gluttony of gourmet coffee shops that the NW offers, Starbucks becomes a very reliable and delicious cup of coffee, albeit expensive. Way more expensive than in the States, too. A tall cup of Starbucks drip coffee in Japan is 340 Yen, about $3.50. That's more than I prefer to pay, so I only stop in on special occasions (I'm super tired, it's Friday) or to soak up the ambiance and get out of the house. Since I'm all alone this spring break (I honestly don't have the phone number of one person who is in the country), I've been going there to work on my papers for my masters classes and catch up on reading. The people who work there are friendly (I know I'm paying them, but come on, it's human interaction!) and it's a chance to practice my faltering Japanese ("taru kohi howsu burendu, o kudasai"). It's nice to just sit and watch people interact, too. A group of older Japanese ladies came into gossip, a young couple looks out the window at the rain, a business man works on his laptop. We really are all the same around the world. Today a guy came in, ordered a cup of coffee, and promptly fell asleep on his table. 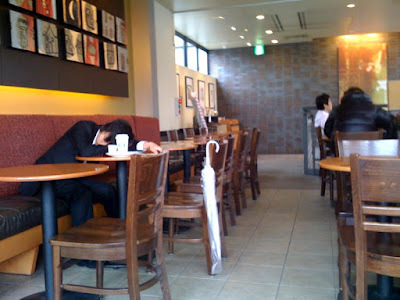 I swear, the Japanese have an uncanny ability to fall asleep comfortably anywhere they wish. 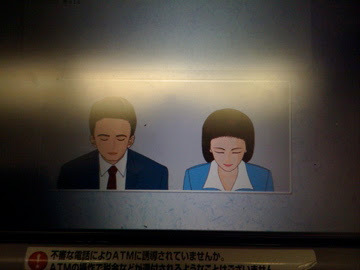 I've seen people sleep standing up on the train without holding onto anything. Many get on the train, put their head down, fall asleep, and manage to wake up just in time for their stop. It's like their body is in sync with the stops of the train. Living in the city takes away the rhythms of nature, and replaces it with the rhythms of the city--alarm clocks, street signals, train schedules, even falling in step with the rush hour crowd. City life takes its toll on people who aren't used to it, but for those who know nothing else, it's their natural cycle. This poor sap needs more than a cup of coffee. I love James's new iPhone. Takes great pictures on the sly! It's getting feverish around here...people are beginning to watch and wait for the first hint of sakura in Tokyo. They cherry blossoms are a yearly rite of passage for all city dwellers, the signal of spring arriving and a time for excessive alcohol, karaoke crooning under the blooms and a break from the winter doldrums. We've been checking this map to see the buds start their blossom from southern Okinawa to northern Hokkaido. Last night we warmed up our voices for sakura season with a little karaoke practice in Shibuya. We had a great night out at an izakaya (a Japanese pub serving many little plates of food for sharing), a few drinks at a dive bar, and then karaoke. A while back James learned I couldn't sing to save my life....I think it was a bit painful being locked in a room with me and a microphone for a full hour. We did find a great new duet though, Anyone Else But You from the movie Juno. I'll spare you the video of us singing. This post is also a little birthday shout out for my friend, Lisa, who turns 30 (before me, I must note) this week! Have a great time singing and belting out Celine Dion! We sang this for you, Lisa! Happy Birthday! Is he shrinking away from me in fear? Shibuya has a lot of everything for everyone. We went in this pet shop around midnight that was selling little puppies. The prices were in the thousands for these poor little pups locked in tiny cages. The sign says it's a smooth chihuaua. Alison, Ingrid, Laura, Mitch and Charity at Dubliners Pub in Shibuya celebrating Laura's birthday. Friday night we went to a Tokyo Apache vs. Shiga basketball game. The BJ League (Basketball Japan) is small and mostly made up of not quite NBA players from the States. It was pretty fun and nice to watch basketball again. Joe Bryant, Kobe's dad, is the coach of the Tokyo Apache.